Something which becomes slowly apparent the more that one leafs through ukiyo prints of the nineteenth century, is setting and representation of the business of the stage. Kabuki theatre represents the greatest subject for Japanese woodblock artists of the period and yet the actuality of what is represented and how, went through noticeable and significant change throughout the whole of the ukiyo period. Early in the nineteenth century, artists were comfortable about drawing the nuts and bolts of stagecraft, but as the century progressed the manner in which dramas and actors were represented became more complex and at certain points (especially during the Tenpo Reforms of the 1840’s), so coy as to be barely recognisable as art of the theatre at all. There is a very revealing portrait of Nakamura Shikan II by Yoshikuni which shows clearly the business of the kabuki stage. At first sight the print seems to show a conventional, albeit stylised, picture of a nursemaid with a child on her back and holding a toy windmill. There is something just a little too flat about the clouds at the top of the picture and as the eye descends, we can see that there are two carefully drawn wedges at the foot of the grassy banks behind the actor. The harshly drawn horizontal at the base of the scene confirms that the landscape is a representation of a painted theatre flat; but the artist has left us with an unresolved problem – the flat on the left of the picture is considerably higher than that of the right. This has served the purpose of opening up some space in the print, reading the image right to left, our eye is drawn into that space and the figure stands more comfortably on the apparent stage. Unfortunately, Yoshikuni has not drawn the corresponding vertical behind the figure which makes the final spatial impact of the print unsettling. Within this paradoxical space we have the further problem with the bold writing which we must assume is occupying the unreality of the picture plane and is not painted on to the surface of the theatre flat behind. All of this is very confusing, and it is hard to determine how much of the final effect is deliberate on the part of the artist and how much is merely following various representational conventions. More interesting is what the space here and the method of representation means to the viewer, especially the audience of nineteenth century Osaka. We have to assume that all of these conventions and the casual muddling of them was a familiar imaginative language that did not require lengthy explanation. Perhaps to our eyes, used as we are to photographic illusion, the print seems to want to jump one way or the other – into or out of real theatre space. These tricks of the stage are not so confusing in the 1852 Kunisada triptych of the kabuki stage (top of page). Here Kunisada (unusually for the period) shows us the stage, the shallow space clearly delineated by the floorboards and the very obviously flat stage set which makes up the backdrop. The sparseness of the stage furniture and the flatness of the set emphasise the richness of the player’s costumes and the print is a verbatim record of the play, the event, the space and the actors. Here, Kunisada uses the conventional text boxes in the form of cartouches to carry the written information allowing them to cross the real space of the picture and showing their difference in space from the scene he has depicted. The same can be said of the Kuniyoshi portrait of the kabuki arch villain Nikki Danjo who is required to enter and leave the stage, (sometimes in the form of a rat) via a complicated trap door. Like Kunisada, Kuniyoshi shows the limit of the stage recession by using receding planks and the flat vertical of the set behind the figure. There is no coyness here, or fudging of reality and illusion. Danjo is not pictured against an abstract cloud of smoke but very clearly rising from the trapdoor in the stage, Kuniyoshi even goes so far as to indicate the precise depth of the planks and beams that support the opening. Animals and mythical beasts are common in kabuki drama and their representation caused similar problems for the artists trying to portray them. The second print of Nikki Danjo from 1816 is by Kunisada; here the artist has portrayed the rat in a fairly realistic way. Contrast that with the fine Osaka print by Hirosada of Ogura no Shikishi. Here the animal represented is a magical white fox, but the drawing here is very clearly that of an actor in a fox costume. Hirosada has been careful to draw in the flap at the fox’s neck which allowed the actor to see where he was going and the gloves on his hands and feet which are clearly clenched up in human form. There is no mistaking here that we are looking at an accurate portrayal of a performance and not an imaginary, ghostly encounter on a moonlit night. 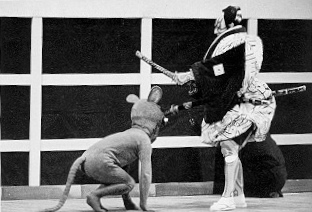 There is a pleasing photograph (left) of the character of Danjo in a similar rat costume to the Kunisada but from a twentieth century performance. By the middle of the nineteenth century prohibitions on the portrayal of kabuki actors and performances encouraged artists to draw their subjects in ironic or disguised forms (sometimes called mitate). The censorship forced artists to take the actor out of the theatre and disguise him within a landscape (for example Kunisada’s masterful 53 Stations of the Tokaido Road). To our eyes the actor is anonymous and the performance unknown; however subtle visual clues in the cartouche and on the garments allowed the theatre goer (hungry for fan portraits) easily to recognise an individual actor. By the 1860‘s the idea of casting the lead character on stage was almost entirely abandoned, with the sole purpose of the print being to portray the star, unencumbered by stage machinery. The art of kabuki never quite recovered from these mid century attempts at censorship. Whilst actor portraits disguised as historical figures were common, (like this superb Kunisada portrait of Nakamura Utaemon IV from the late 1850’s), there ceases to be any visible stagecraft in the prints. 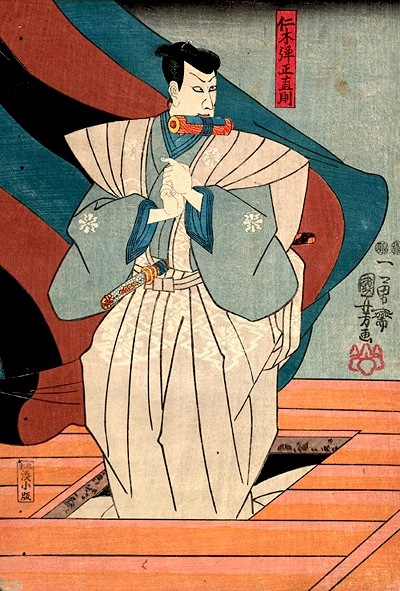 When required, references to plot and stage props tended to be inserted into substantial cartouches as (here) in the upper left, or in large sections of the print as in the great series of actor portraits by Kunichika from 1893. By the last decades of the century, the art of kabuki was losing its grip on the Japanese public and it was really only Kunichika who kept the kabuki portrait alive, making the last great triptychs of his life precursors to the magnificent movie posters of the 1950’s – panoramic and graphic, using great sweeps of bare page to great effect. The history of portraying the theatre as it was is one of increasing coyness and covertness, an art form that was to be more or less extinguished by the turn of the twentieth century. Toshidama Gallery is showing theatre prints by the Osaka School of Artists until the 20th April 2012. This entry was posted in Floating World, japanese woodblock prints, kabuki theatre, Kunichika, Kunisada, Kuniyoshi, ukiyo-e art, Uncategorized and tagged Hirosada, Japanese Woodblock Prints, kabuki theatre, Kunichika, Kunisada, stagecraft, ukiyo-e art. Bookmark the permalink.